In the suburbs of Pittsburgh, Pennsylvania lurks a desolate manor, home to the most savage creatures of the undead - Hundred Acres Manor Haunted House. It’s a 40,000 square foot intense, run for your life, scream bloody murder, haunted attraction that uses state of the art technology to terrify its victims, coupled with the industry’s most talented actors. The haunt uses every industry resource known to make this haunt a true mind-bending experience. The haunt is set in South Park, a sprawling park with tree lined, winding roads that really set the mood early, as you feel you’re getting further and further from rescue the closer you get to the haunt. The terror begins in the parking lot, with actors working the crowd from the minute you arrive, ghastly creatures, giant characters and queue entertainers provide a glimpse of the horrors that await in the darkness. The atmosphere is electric, with the sounds of screams echoing around the park, and more than 15 fog machines pumping as fast as the screaming music. Once inside you are greeted in the parlor by a skilled character actor who introduces the haunt, along with a state of the art animatronic show, featuring Haunt Bots technology, that really sets the mood. Then you’re set free to roam the haunt with your party at your own pace. You’ll find mostly live actors along the way – the haunt has more than 100 actors working on an average night – which really adds to the scare factor. There are also lots of cutting-edge animatronics props – new for 2010 is one so realistic and disturbing that patrons are not ever going to forget seeing it. The effect of that many live actors adding an element of surprise, and the high-quality animatronic props providing the most perfect set-up scares, is that you spend your entire visit in total terror. There’s no slow part in this haunt. The haunt is actually five haunts in one attraction, making it by far the area’s largest haunt. A single calling card admits you to Massacre Mansion, South Valley Hospital, Site-R, the Maze and the Grindshow Bazaar. It’s going to take you about 45 minutes to work your way through the entire experience, and at the lowest ticket price of all the major haunts in and around Pittsburgh, it’s definitely the best value for your money. And even if you’ve been before, there is so much new each season that you will want to visit every fall. 2010 unveils 5 all NEW attractions to pick at your mortal brain and send you into a mental mind twist. Do you dare brave Pittsburgh’s best haunted house; Hundred Acres Manor? The terror returns this fall and will unleash new and inconceivably horrifying chambers for you to tour. Seven brutal years have passed since the ghastly spirits of the Manor have allowed curious visitors to take a peek behind the walls of the decaying Acres family estate. Many have tried their luck at surpassing the ultimate test of life verses death within the manor compound and even more souls have met their demise at the hands of the most vicious creatures that reside within the Manor compound. Do you dare brave Pittsburgh’s most intense, run for your life, scream yourself to death haunted house? 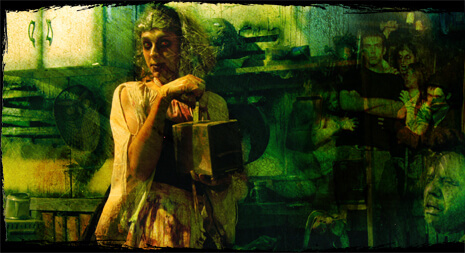 The horror returns in 2010 and the troubled spirits have already etched your name on a tombstone! Tours of the manor will reveal new and terrifying catacombs unlike any that have been seen by the mortal eye. The new tombs open for exploration will reveal vast depths of Hundred Acres Manor, but be forewarned; evil lurks behind every corner! The Acres family estate is overrun with ghastly creatures and the undead that are just dying to meet you. Do you have the guts to survive the horror that awaits you? Foolish beings, daring to walk on unearthly ground. Do you dare disturb the slumber of the undead? The legend comes to life this September; Getting in is easy, getting out may kill you! It’s only a haunted house…Right? Do you have an appointment? Check in at South Valley Hospital for a dose of extreme terror. Brutal, gut wrenching, gory terror comes to life this October at South Valley Hospital. 2010 will bring new meaning to the word Trauma! Check in to South Valley Hospital and discover the horrors that transpired on the grounds of what was once one of the most prestigious trauma centers in Pennsylvania. South Valley Hospital was opened to the public in 1904. The South Valley Hospital was once Pittsburgh’s premiere medical treatment and research facility. Rumors began to circulate in the late 30’s of botched surgeries, “accidental deaths” during routine procedures, application of mind altering experimental drugs on unknowing patients, necrophilia and other unspeakable horrors. In September of 1932 the medical board began investigations on the staff at South Valley Hospital; what they found was the most shocking and brutal display of complete disregard for human life. Mutilated bodies, failed operations, patients wired up to shock treatment machines and strapped to gurneys like animals, bodies hung like cattle in the morgue, and un-sedated brain surgeries were just some of the horrors that were uncovered. The hospital was closed in December of 1932 and has been abandoned ever since. Some say that the tortured spirits of the patients still reside within the hospital compound. Do you have the guts to endure the torture? Let us cut you open and find out. One of the earliest American underground facilities was built in Bethel Park, Pennsylvania on the site on the Acres family estate. The military refer to the facility as “Site-R.” The site was chosen in part due to the suitably dense base of greenstone, the fourth hardest rock on earth, that stretched nearly to bedrock, along with a generous donation by the property owners. Construction began on Site-R in 1950, and engineers had completed a series of tunnels and a three-story building by 1953. Two more three-story buildings were completed by 1963. The complex lies 650 feet beneath the earth’s surface and can be entered through four portals that could quickly be sealed during times of crisis. Site-R featured everything needed to survive a catastrophe including chemical suits, a medical facility, and a testing ground for top secret military experimentation. It has six 1,000 kilowatt generators and 35 miles of cable delivering power for much needed machinery. But that’s not what they used it for. Fool me once shame on me. Fool me twice; YOU GO INSANE! Get lost in terror as you attempt to navigate your way through our all NEW 7,500 square foot maze from hell. Was it two lefts, a right and a left? Or was it three lefts, two rights and a left? You better find the answer quickly or you will be hacked to pieces by one of the chainsaw wielding maniacs that reside within the labyrinthine confines. Don’t bother asking for directions, we murder first then answer questions later. Oh, we just love to watch you squirm in an eternal state of panic. It’s like watching a mouse trying to get out of a trap. There is no escape from the eternal darkness that is the maze. Good luck trying to find your way out of the darkness, it is certainly not as easy as it sounds. New horrors lurk around every corner and each vicious creature is out for your blood. Let the mind bending commence! Step right up to the Grindshow vestibule and unmask a world of wonderment and macabre! This, my friend, is no quotidian ragbag, for the Grindshow Bazzar possesses curiosities beyond your wildest imagination. Saunter through a world that time has a. This is the terrain of the kooky, the eccentric, and the unequivocal carnage and sacrifice. This, my friend, is the greatest show unearthed! Established long ago, the Grindshow Bazaar amazed and astonished spectators from across the span of the countryside. Folks flocked to bear witness to the show that was said to end all shows. Performers driving themselves to the brink of death, all the while retaining their cool composure, sold stubs like hot cakes, and the threat of bloodshed for the sake of a standing ovation piqued the interest of audiences from every walk of life. Now that is entertainment, friend. Those were the days. Do not fret my consort; the bazaar, once forgotten by its once faithful patrons, will rise again this Fall on the site of the Acres family estate. Come one, come all, to and try your hand at a game of chance, but be astute for your wager may just be more than you bargain for. Unlike many haunted attractions, Hundred Acres Manor has a permanent location, which allows them to build really complex sets and install some heavyweight props. You’ll hear improvements being made throughout the entire off-season. Set on the site of an old swimming pool – a site that brims with old ghost stories – Hundred Acres Manor Haunted House has been open since 2004. Each year the haunt grows, adding new attractions (there are three entirely new attractions this year), reworking old ones (the maze was torn down at the end of last season and totally rebuilt), and upgrading staff training and actor coaching. Hundred Acres Manor features over 60 rooms and hundreds of corridors that guide your tour through this unparalleled event. Hundred Acres Manor also features a 7,500 square foot maze of confusion. Prepare yourself for a relentless 45 minute journey of mind bending torture and hell that seemingly has no end. Hundred Acres Manor Haunted House is a charity haunt – the profits from the haunt are donated to Animal Friends, an animal rescue center, and The Homeless Children’s Education Fund, an organization that works to ensure that homeless children and families in transition get continued access to education. All of the actors are volunteers. Many of them give significant amounts of their time to the haunt – the main characters are regulars who also help out with building and maintenance, and many put in more than 20 hours a week during the season. A benefit of being a charity haunt is the celebrity help that the haunt gets – every year the Pittsburgh Steelers players come in a crowd to the haunt to walk through it with their friends and family and then to dress up in costume and act in the haunt. For wide receiver Hines Ward last year it was an opportunity to scare people in a different way to what he does on the field. Offensive lineman Max Starks really enjoyed chasing people with the chainsaws. For the 2009 Steelers Player Night, Hundred Acres Manor tried a new night – they opened on a Monday and had the Steelers come out then – it worked well. “People are really excited to support both their Steelers and give money to a good cause. Whatever day of the week it is.” Said Ted Sobek, executive director of Funds for Charities, the organization behind the haunt. Ted hopes that this is the year that his charitable efforts total raised will hit the $2 million mark. The haunt takes its business seriously – being a charity haunt doesn’t mean they cut any corners in their work. In the off-season the actors work on character-building and acting training. The actors are skilled and committed to making the haunt experience as terrifying as it can be; they bring the element of surprise and a lot of fear to your visit. There are four talented makeup artists and a costumer who works with the actors to ensure that as many customers leave terrified as possible. Hundred Acres Manor is open nights through September and October and sees over 30,000 visitors in a single season. In 2010 the house opens on September 17th and will be open for 34 nights. The haunt opens at 7pm and closes around midnight on most nights.